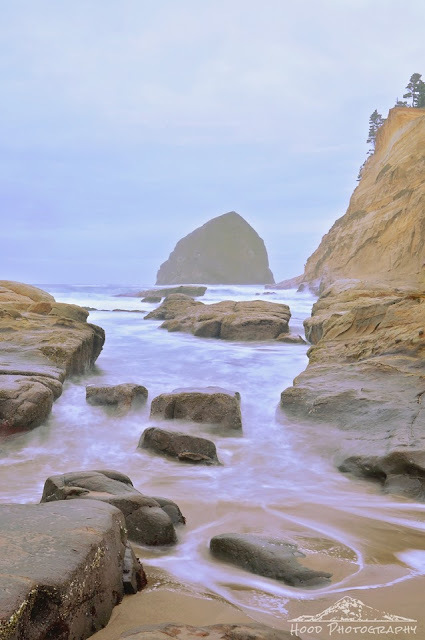 I just returned from a sweet vacation with my family to Cape Kiwanda in the town of Pacific City. The weather was classically Oregon, as it was cloudy and rainy most of the trip. However, we did not let that stop us Oregonians from having a good time. While braving the outdoors, I took this photo of Haystack Rock, which stands 327 feet above the ocean and is the fourth tallest sea stack in the world. It is also apparently one of three stacks in Oregon named Haystack Rock. It stands out so well. Terrific shot! That's beautiful! I love the smooth water. Sweet shot - I like the way you've "frozen" the water! Thanks for sharing at http://image-in-ing.blogspot.com/2014/10/the-many-faces-of-louie.html. Wonderful shot! Looks like a fun time! I love the dreamy like water shot. Beautiful! Such beauty ! Thanks for sharing the view with us ! Beautiful scene and a lovely photo.. I remember visiting the Haystack Rock on Cannon Beach! The Oregon coastline is gorgeous.. Happy skywatching and have a great weekend! Fantastic shot, great job on slow-motion on the water; it's great that you and your family didn't let the weather dampen your spirit and experience. Great photo. I like the ground level perspective. What a beautiful photo -- absolutely love it! Haystack Rock is a perfect name for it. I adore this image. Mystery abounds. Sea is so still.